Posted on Mon, Feb 20, 2012 : 5:58 a.m.
A Five Guys Burgers and Fries restaurant is opening in Arborland Center off Washtenaw Avenue this spring. 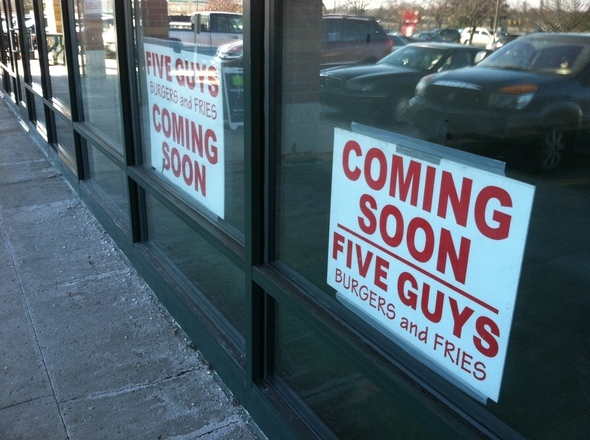 The owners of the Five Guys Burgers and Fries franchise restaurant on State Street near the University of Michigan campus plan to open their second Ann Arbor restaurant this spring: located in the Arborland Center off Washtenaw Avenue. Franchise owners Michael Abrams, Brian Adelman and David Pittaway signed a lease in January for a 2,579-square-foot space in the outlot portion of Arborland near Starbucks Coffee, a space most recently occupied by America’s Best Contact & Eyeglasses. America’s Best moved two storefronts down in August to expand. Renovations are currently underway at the new Five Guys location, and a sign announces the restaurant is “coming soon.” Abrams said the goal is to open by the end of May or early June. This is the 16th Five Guys restaurant the three business partners have opened in Michigan, and they are quickly adding more. One is set to open in Portage, Mich. a month after the Arborland location opens, with the ultimate goal of opening 30 or 40 restaurants. 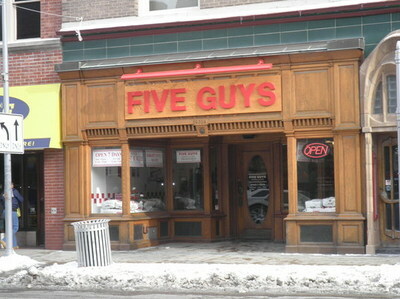 The Five Guys on State Street opened in January 2011 in the former Shaman Drum Bookshop. Virginia-based Five Guys has more than 750 locations throughout the country. The restaurant keeps things simple by offering a menu of hamburgers, hot dogs, fries, grilled cheese, a vegetarian sandwich and Coca-Cola products. “Wherever we open, as long as there are people, we will be successful,” he said. The State Street restaurant opened in January 2011 in the former Shaman Drum Bookshop, and Abrams said its performance level is in the upper half of their 15 open locations. Although he called it a “headache,” he said they might consider keeping the State Street restaurant open until 2 a.m. on weekends in order to cater to college students. Abrams said he decided to open a restaurant at Arborland after seeing the success of Starbucks, Cold Stone Creamery and Noodles & Company in the retail center. He called the parking situation at Arborland “a little suspect,” but he said he hopes that when the outlot parking is full, people will park in the larger Arborland lot and walk over. Michael Lippitt and Richard Shlom of Landmark Commercial Services marketed the space. Amcap Inc. owns the Arborland Center. Tue, Feb 21, 2012 : 11:19 a.m. Went to the State location, but all the screaming and hollering made me lose my appetite . Tue, Feb 21, 2012 : 3:17 a.m. I don't think people are complaining about parking so much as safety. Have you ever tried walking from the big lot to that smaller one? You are taking your life in your hands. People driving in the lot do NOT look for pedestrians. They'd need a better cross walk or something. Tue, Feb 21, 2012 : 5:37 p.m.
My experience is that the traffic is far from nonstop. My experience is that its not hard to find a sufficient break in traffic to cross safely. But I admit i am reasonably fit and mobile. Mon, Feb 20, 2012 : 10:58 p.m.
Krazy Jims is way over-priced. This is the dirty little secret of this town. The nickel and diming on the separate ingredients and toppings really adds up. Mon, Feb 20, 2012 : 10:14 p.m. I'm from DC and Five Guys has the best burgers hands down. Blimpie's is overrated and you get yelled at so why bother? Mon, Feb 20, 2012 : 8:53 p.m. I would guess Krazy Jim's burgers have about the same calorie count as Five Guys. Mon, Feb 20, 2012 : 8:07 p.m. I have lived in Ann Arbor for only two years. Does anyone know why there is no Boston Market? I have heard that there used to be on on Washtenaw. Tue, Feb 21, 2012 : 2:34 a.m.
Tag, your correct. When they filed bankruptcy is when McDonald's acquired them. Boston Market still exists as a privately owned corporation. Mon, Feb 20, 2012 : 8:52 p.m.
there was one where the McDonald's now is just east of Huron Parkway. That Boston market disappeared when McDonald's sold the Boston Market name to Sun Capital Partners. McDonald's originally bought Boston Market out of bankruptcy for the real estate. So when they sold the name they knew all along they were going to turn that spot in to a McDonald's. Mon, Feb 20, 2012 : 8:51 p.m. Didn't Boston Market file for bankruptcy years ago? Mon, Feb 20, 2012 : 8:44 p.m.
Boston Market on Washtenaw near Huron Parkway wasn't doing well. Their prices were high, so people went to the KFC up the road for cheaper chicken. Obviously, the McDonalds, which replace Boston Market, is doing fine. Mon, Feb 20, 2012 : 7:32 p.m. I know people hate having a mass amount of chain restaurants in one area but I sure wish Texas Roadhouse would buy that space where Borders used to be in ArborLand. Thats one of my favorite restaurants and I wish there were one in town. Back to the story though, Five Guys is okay but its hard to beat Krazy Jim. I'm sure it will do well in that space though, and I'll probably be a somewhat regular visitor considering I live down the street from the plaza. Tue, Feb 21, 2012 : 12:46 a.m. I am hoping a Texas Roadhouse or Famous Dave's could take over the Borders or Circuit City buildings. Mon, Feb 20, 2012 : 5:05 p.m.
Why are people allergic to merely crossing the gap from the plentiful parking at the former Borders area to this corner of Arborland? Mon, Feb 20, 2012 : 6:04 p.m.
My thoughts exactly! Anytime I go over there I always park in the lot across the road from that little strip of stores. It's not a big deal at all, but people aren't happy unless they can complain about something, I guess. Mon, Feb 20, 2012 : 5:57 p.m.
Because there's isn't a crosswalk with day-glow signage and flashing lights? Mon, Feb 20, 2012 : 4:27 p.m.
Ack, there goes my waistline! 5 Guys right next to Coldstone, eek! Tue, Feb 21, 2012 : 3:26 a.m. But unlike the Bermuda Triangle, you'll know exactly where that cholesterol is going (and staying). @SMC that's funny, Bermuda Triangle of cholesterol, haha! With Chili's across the way, it's like the Bermuda Triangle of cholesterol. Mon, Feb 20, 2012 : 3:19 p.m.
Mon, Feb 20, 2012 : 3:09 p.m. I was hoping they would buy the old Circuit City location. Just imagine how many burgers they could serve out of that place! Mon, Feb 20, 2012 : 2:50 p.m. I'd still rather contend w/campus parking...but go to Blimpy's. Mon, Feb 20, 2012 : 2:36 p.m.
Any new restaurant is welcome on the north side of town, someone could make a bundle if they actually opened a quality spot anywhere on Plymouth road or Washtenaw. Mon, Feb 20, 2012 : 1:01 p.m. I might add that I like a good whine as much as the next guy, but I think complaining about parking there is a bit over the top. Mon, Feb 20, 2012 : 1 p.m.
Mon, Feb 20, 2012 : 12:59 p.m.
as parking goes it may not be the best in Arbor Land but it sure beats downtown. Heck, I've been known to hit Hillers and Petco from the same parking spot. Tue, Feb 21, 2012 : 12:35 a.m. I guess I'll have to hit Old Navy and Toys-r-us from the same spot just to keep my mojo. Mon, Feb 20, 2012 : 10:31 p.m. I've hit Hiller's and Michael's from the same parking place. Mon, Feb 20, 2012 : 12:58 p.m. Truly amazing, the things people find to complain about. If you can't walk an extra twenty yards or so from the larger parking lot, maybe you shouldn't be eating at Five Guys in the first place. Mon, Feb 20, 2012 : 12:04 p.m. This is wonderful news! The parking is just awful for that section of the center! Why there? Why don't they re-design the parking? I love Noodles but seldom go there due to the parking. Mon, Feb 20, 2012 : 4:24 p.m. I love Noodles &amp; Co., too. I also have used America's Best and have gone to Starbucks while waiting for my car at Firestone. I agree, the parking in that tiny strip is awful. Which is why I never even look for a space there. I always assume it will be full, and am happy to park my car on the other side of the divide. It actually saves time to park and walk rather than wrestle around with other drivers for one awkward spot. If anything, Arborland could try to redesign the entrance at the light. Glad to see a new business setting up shop! Mon, Feb 20, 2012 : 2:16 p.m. Unless your disabled, or lazy the parking is fine. Mon, Feb 20, 2012 : 11:19 a.m.
Mon, Feb 20, 2012 : 11:13 a.m.
Mon, Feb 20, 2012 : 6:58 p.m.
Mon, Feb 20, 2012 : 2:52 p.m. I don't even bother with that strip of parking if I'm over there. There's no point. I just hoof it and pray some moron trying to get as close to Starbucks as possible doesn't run me over as I cross. Mon, Feb 20, 2012 : 11:22 a.m.
Just park in the Boarders lot and walk the extra 20 feet. You are going to need to after eating there anyways.